Tolstoy has suggested that: “The vocation of every man and woman is to serve other people “. In this brief presentation I am aiming to demonstrate how I have tried to do it. How I have tried to serve other people. My study is about design. According to Nelson and Stolterman design is not about self-expression. Design is not about self-service. Design is other-service. Design is always an attempt to serve other people. In a well-known online directory of learning tools — maintained by Jane Hart of the Centre for Learning & Performance Technologies in England — there are over 2000 tools for learning. It is obvious that more and more learning is mediated by digital technology. Helping someone to learn is one of the most fundamental services we do for other people. Doing the service we may use tools — learning tools. Both learning and tools are in the core of our culture. As part of my study I have designed tools people may use when helping each other to learn. With these tools I serve other people. By seeking methodological insights on how to design learning tools, I am aiming to serve those people who design learning tools and do research on them. Figure 1: Timeline of the Main Paradigms of Using Computers in Learning. (Some rights reserved). My study examines design of software learning tools in the era of the Web, social software and open content. This partly frames the contemporary socio-technical environment where I have done the research and design work. What are the key findings of the study? And how did I get these findings? My study consists of five original articles and a summary article. Four of the articles describes design of four learning tools. The study relies on my personal involvement and experience gained by participating in design processes of four distinct and experimental software tools that aimed to enhance learning in different contexts . By analyzing and reflecting the design processes I present methodological discoveries and insights. designers should be aware of the need to move between different knowledge interests. Lets take a close look of these. Research-based design process is a model for academic design research relying on design practice. In it the attempt is to design and experiment with new tools and strategies. I do not claim that research-based design process is the only possible methodological approach, but it is an approach tried out and found appropriate. It is not a recipe to designing good tools — rather it is a methodological design research approach. In the research-based design process there are four phases. 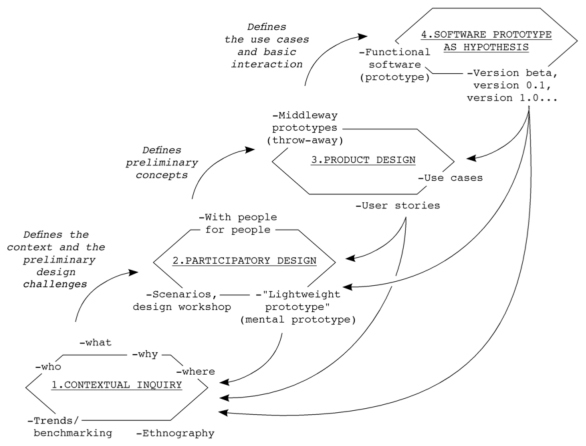 Figure 2: Research-based Design Process: Contextual Inquiry, Participatory Design, Product Design, and Production of Software as Hypothesis (Some rights reserved). The research-based design process starts with an exploration of the socio-cultural context of design. I call the first phase Contextual Inquiry. The aim is to understand the context and to define the preliminary design challenges. In practice the contextual inquiry in design often includes and rapid ethnographic methods with observations and interviews as well as literature studies. The result of the contextual inquiry are preliminary understanding of the context and some preliminary design challenges. The second phase, Participatory Design, brings different stakeholders to design the products and services that are driven by the design challenges defined in the contextual inquiry phase. Participatory design takes place in design workshops with the stakeholder. In the case of learning tools the participants are often teachers, pupils and parents. In the workshops the participants are asked to comment and prepare scenarios, sketches and light prototypes. The expected results of the participatory design are some preliminary design concepts, some early product or service ideas. Based on the participatory design sessions, the third phase, product design, attempts to define use cases and basic interactions with user stories and throwaway prototypes. In the case of software learning tools, the product design phase refers to the operations carried out by the designers and the software engineers. In the product design they translate the results of the contextual inquiry and the participatory design to information architecture and human-computer interaction models. In practice, the professional designers will need some distance from the stakeholders, in order to have a chance to use specific design languages. The results of the product design are use cases and basic interaction models. The software as hypothesis phase delivers functional software. I call these software artifacts hypothesis as their design is based on number of assumptions. They carry in them some ideas on what will be their impact to the socio-technical environment and the context where they where design and where they will be used. This way the software prototypes are potential solutions to the design challenges defined earlier in the process. The second key finding – methodological insight – of the study is the suggestion, that designers should accept that design is often based on informed guessing and also aim to the situation where they are able to do informed guesses. In a research-based design process the amount of information gathered, in one form or another, is often breathtaking. All possible information should be documented, not to be fully analyzed, but to guide the design process: to be used as a reference and to help in the case of a need to recall some event during the process. Figure 3: Intentions of Research-Based Design Process in Learning Tool Design. (Some rights reserved). From the design of software learning tools I have recognized several dimensions of disciplines that are used in the design process. The emphasis in the design of learning tools is in service. The tools are there to serve learners, not for instance, primary to help teachers. The art and science dimension and tension is often discussed in the field of art and design. In the case of designing learning tools the ability to understand and work in both ends of the dimension is also important. Designers would benefit of being aware of the pedagogical ideas but also about the characteristics of media. 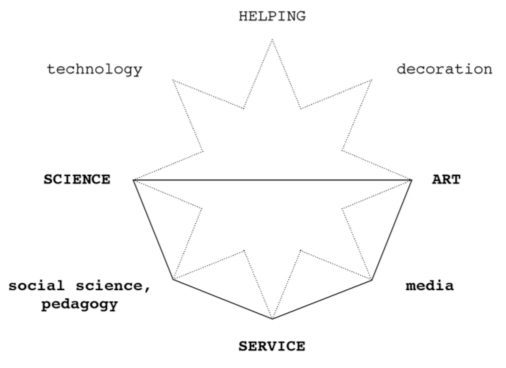 Using theories and methods of social science, pedagogy and media studies would be beneficial for designers. Even that designers may also contribute to these disciplines the approach should be utilitarian; they are expected to serve the design process. The disciplines used and the research done can be expected to inform the guessing done in a design process. The third key finding of the study is related to different knowledge interests. Designers designing for and in complex socio-technical system should be aware of and able to move between different knowledge interests. To illustrate the situation, I have used Jurgen Habermas’ well known categorization of human knowledge interests and Karl Poppers theory of the tripartite division of physical and mental states. I have combined the Habermas’ three primary knowledge interests and Poppers worlds to a single table. On top of the table I have locate the phases of the research-based design process. With the picture I try to illustrate the complex situation learning tool designers face. 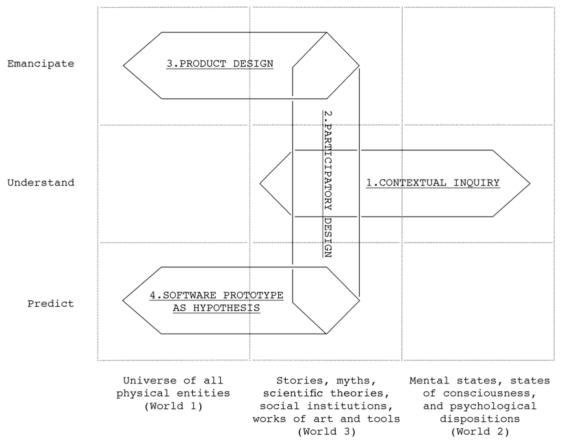 Figure 4: Interaction of Interests of Knowledge and Movement Between Different Popperian Worlds in Research-based Design Process. (Some rights reserved). During the different phases — which in practice often take place in parallel — designers can be expected to be able to move from hermeneutic understanding to emancipative thinking space, and also to technological and physical realism. The participatory design practices are the clue joining the different knowledge interests. Working participatory with people in the “knowledge world” requires navigation between the different interests, but also ability conclude with design solutions. Designers can be expected to stand the pressure of different knowledge interests and find strategies to move between them. I have found it important that designer are able to communicate and deliberate between the interest but still keep focused to product or service under design. Designers are responsible to guarantee that required design decisions are made and the product or service is delivered. I have now explained the findings of my study. In the following I am aiming to clarify how did I get the results. As mentioned my study builds on my personal experience gained by participating in design processes of four distinct and experimental software learning tools. These learning tools aimed to enhance learning in different socio-technical contexts. In these design cases I have act as the design director. The design cases are summarized in the following table. Table 1: The Four Design Cases: The Context, the Challenge and the Hypotheses of a Solution. (Some rights reserved). The design cases can be viewed as practical experiments and strategies to reach a developmental and expansive, constantly developing design process. Within each other them I have defined the design context and design challenges. In these the software designed and develop tried to be if not the — at least part of the — solution to the challenges. The learning tools described in the study are extensively used in different experimental learning practices and learning communities around the world. We may already claim that these tools have had an impact on the field. Same time these design processes have provide me a framework to develop the methodological insights presented in this study. At this point I think I can present something that is generic for certain kind of learning tool design. My study presents — as Donal Schön calls it — the action of a reflective practitioner in an on action. The primary reflection in action took place in the actual design practice of the four cases, whereas this study reports more the reflection on action. More and more learning is mediated by digital technology, by different kind of digital tools, and since learning is a fundamental human right we have a great responsibility. The tools designed and used for learning are shaping our future. There is a need for academic practice-based design research of these tools. Design research can deliberate and bring alternative approaches to the discussion; it can be critical and comprehensive. Leinonen, T. (2010). Designing Learning Tools. Methodological Insights. Aalto University School of Art and Design. Helsinki. Posted in Aalto University, Design, educational tool, General, Open Source, Social Software. Thanks for the interesting blog post. Have you read Button & Dourish’s articles about what they call Technomethodology? Also worth reading is Crabtree’s Taking Technomethodology Seriously article? They describe an alternative paradigm to this that you might find interesting. Contact me if you’d like to discuss this. Maybe we could write something together? Interesting. There are definitely similarities, although I would argue that even if you’ll “let designers build whatever they want with whomever they want, subject to their own constraints” one should ask designers to argue what was their (constrained) design challenge they tried to solve with the prototype. With the communication effort the designers’ prototype will contribute to the contextual inquiry. Because the first attempts to define the design challenge are most likely delusional it is also important to think how much “building” is required or would a simple sketch or paper prototype serve the purpose. With these rapid prototypes we already are partly covering the PD and product design phases, too. Writing together is a great idea. I’ll write you an email.